The circular issued at the behest of the vice-chancellor cannot be seen as an isolated measure. The circular continues, “when fellows are being admitted for PhDs, the topics for the thesis should be in accordance with the national priorities.” It, therefore, ‘directed’ all the heads of the departments “to convene the meetings of the faculty and prepare a shelf of projects to be taken for research study pertaining to their subject considering national priorities. “The student can opt from the shelf of project. Allotting privilege topics to the PhD students should be dispensed with,” it says. The circular may appear to be harmless and with good intention for the general public and for the innocent and reactionary academics. But a close look at the circular, its intention, tone and sense are very anti-intellectual, let alone anti-academic. As for the tone of the circular, it reminds one of the dictum “medium is the message” by media theorist, Marshal McLuhan. It autocratically (hence un-academically) enforces an anti-academic measure. The circular is, put simply, an outrageous encroachment on academic research, freedom, autonomy and dignity. It also has larger implications like the assault on the freedom of speech. The circular issued at the behest of the vice-chancellor cannot be seen as an isolated measure. The VC had made news a few months back by removing the head of the department of English for posting a Facebook comment on the highhandedness by the university against a poor Dalit student. The High Court intervened and reinstated the academic in his position upholding freedom of speech. The political theorist of a vice-chancellor would do well to remember Immanuel Kant’s outstanding political essay ‘On Enlightenment’ before applying bureaucratic restrictions on academics. In fact, maybe almost about a half of philosophy would be political philosophy dealing with human emancipation and freedom. What is disturbing in the wake of the circular is that despite its reactionary and totalitarian nature it has not evoked a befitting response from the academic community in the country. This is even while the print media has alerted it against the unacceptable and harmful precondition. There is every reason that the academic community, particularly in the Central University of Kasargod, should be aggrieved over the circular, for they are the immediate losers in this action. Nothing is heard about the academic community there agitating over this objectionable order. This complacency, if it is so, tells two things. One, the university academic community is either scared of agitating, and is already silenced or is not even collectively conscious or serious about academic autonomy and authentic research. Or it could be both of them. There is every possibility that this is the most unthinking stipulation ever issued in any civilised society on academic research. The one notable thing, amidst isolated murmurs against it, is the resignation from the board of studies of Professor Meena T. Pillai, an academic from Kerala University. Hers is a highly ethical academic gesture. She has also successfully tried to raise an alarm and alert the national media and public about the danger of the circular. Now let us take the stipulation ‘national priorities’ mentioned in the circular. What are the national priorities? Who will decide these national priorities? Are the national priorities the ones of the ruling government which are the same of the ruling party? Will anyone be able to identify a few national priorities with regard to PhD research? Can a research which probes the demonetisation, for example, be counted as one with national priority? Will this satisfy the ruling class as one of national priority? Can national and international priority merge or fuse on a topic like climate change which is one of the greatest concerns these days across disciplines? Besides, the current discourse of over-enthusiastic nationalism weighs too much on this formulation. It is worth remembering what the great national poet, Nobel laureate and thinker, Rabindranath Tagore says on nationalism versus education: “India has never had a real sense of nationalism. Even though from childhood I have been taught that idolatry of the nation is almost better than reverence for God and humanity, I believe I have outgrown that teaching, and it is my conviction that my countrymen will truly gain their India by fighting against the education which teaches them that a country is greater than the ideals of humanity” (Nationalism in India). An inescapable fact in PhD research is that it is the passionately inquisitive students who very often bring new ideas into an academy through their research proposals. Each human individual is different and unique and so is each researcher. Preparing an inventory of research is not only authoritarian but also would foreclose such a possibility of coming up something new. It discourages curiosity and passion which are essential for academic research and devaluates researchers into government report writers. (The writer is assistant professor of English and research supervisor, Sree Sankaracharya University of Sanskrit, Kalady). A close look at the circular would prove that its intention, tone and sense are very anti-intellectual, let alone anti-academic. What is disturbing in the wake of the circular is that despite its reactionary and totalitarian nature it has not evoked a befitting response from the academic community. The university academic community is either scared of agitating, or is not even collectively conscious about academic autonomy. 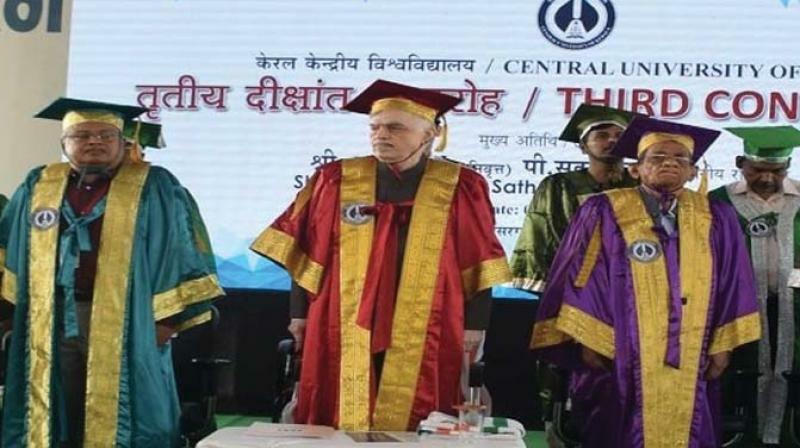 University vice-chancellors behaving like bureaucrats and rubber stamps of the governments is not in the interest of the academics, nor that of the nation. An inescapable fact in PhD research is that it is the passionately inquisitive students who very often bring new ideas into an academy through their research proposals. Preparing an inventory of research is not only authoritarian but also would foreclose such a possibility of bringing up something new.